These Optix 55 Bifocal Reading Sunglasses are comfortable bifocal readers that double as durable and well constructed sun glasses. You will love these glasses! They feel almost weightless on your face, and come in bifocal reading lens prescription ranging from +100 to +350. Prescription glasses help us see near or far, sunglasses protect the eyes from UV rays. Now you can combine the two! This frame sports a hard plastic outer shell to prevent breakage. The Optix 55 Bifocal Reading Sun Glasses come with a FREE microfiber pouch that also serves as a cleaning cloth. These glasses are light and easy to travel with. 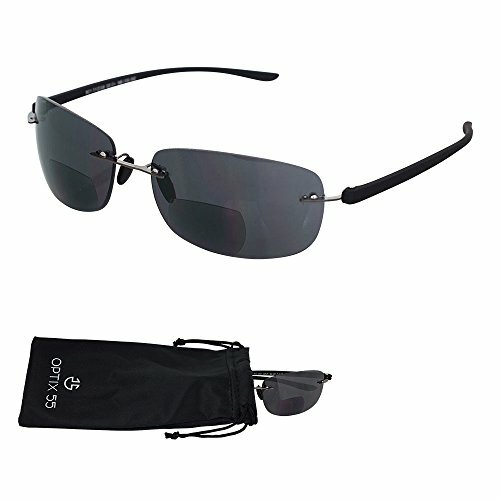 With their dual purpose - readers and shades - They are perfect for reading on the beach, or outdoor sporting activities. You can wear them as shades all the time, and then as readers when you need them. There is no "bifocal line" so they do not appear to be reading glasses. Reading in the sun can often be tough, with glares often making books, newspapers and magazines unreadable. These bifocal reading lasses gives you the option to read with ease and when you are not reading, enjoy the benefits of high quality uv ray protecting eye-wear. Protecting your eyes from the sun and sun glare is now easier than ever. Buy yourself a pair or two of these Optix 55 Bifocal Reading Sun Glasses now. These Optix 55 Bifocal Reading Sun Glasses make a great gift for the holidays. FASHION & PROTECTION: These stylish frames have the classic rimless look, and have magnifying corrective bi-focal lenses. INVISIBLE: Designed so the bifocal line isn't visible when being worn. Seamless & "seenless" transition from shades to readers. NEUTRAL COLOR: The black matte color will go with any wardrobe choice or style. Casual or dress - these shades suite anything. LIGHTWEIGHT & DURABLE: These readers & shades are light & compact, and made of premium materials that are long lasting. POUCH INCLUDED: A branded microfiber eyeglasses holder is included which has a drawstring and doubles as a cleaning cloth.